The fight for justice is no popularity contest, and the battle can be exhilaratingly powerful | Jon Katz, P.C. On several occasions in late 1999 to early 2000, I spoke with Ramsey Clark one-on-one, as we prepared for and pursued our criminal defense jury trial representation of Plowshares activists who had hammered on depleted uranium-firing A10 warthog military airplanes. He pointed out the obvious, but still revealed himself, about how the number of interesting political activists to defend expand when the lawyer does not seek pay for the work. He never had an unkind word about anyone, not even J. Edgar Hoover, saying he thought Hoover meant well. Apparently Ramsey was seen as controversial enough even when still at the Justice Department, that he told me of not being invited with his now late wife — Georgia, who spoke as kindly to me when answering his office phone, as Ramsey did to me — to various Washington, D.C., social gatherings that he otherwise would have been invited to. People can agree or not with Ramsey’s stands and client list, but I saw a man who follows his conscience at least during his time in private practice, has no apparent ego, is kind, and is lowkey in talk. He is a role model for me to keep my eyes on the prize of fighting for justice for my clients. Plenty of police and prosecutors strongly disagree with my deep commitment for my clients and my conviction that I work on the side of the angels, and I often feel even more strongly against their viewpoints. But it would be a distraction for me to dwell on my view of them for but a moment, if even that. Ramsey may be soft spoken in tone of voice, but is direct in speaking his mind. We first met, with little more than a handshake, twelve years before co-counseling in the Plowshares four case, when I attended the Federal Bar Association’s 1987 Tom C. Clark award dinner, when the awardee was a Justice Department criminal division career lawyer and the audience was populated with numerous criminal division colleagues. I attended at the suggestion of a lawyer at the federal financial regulator where I was law clerking for the summer, knowing I wanted to network as I tried planning and making sense of my law career direction, and without my even realizing until arriving at the dinner that the awardee was a prosecutor. Ramsey was elusive that night when I met him early in the evening after I had little to say because I knew little about him beyond my agency’s lawyer referencing him as flaky for having visited North Vietnam as the war raged. Such elusiveness repeated itself when I met Gerry Spence the next year and asked him why he special-prosecuted a capital murder case when he had already professed to be opposed to the death penalty, and Gerry merely referred me to his book Gunning for Justice; Gerry’s explanation did not satisfy me. Ramsey and Gerry both became and remain important teachers for me, with me both getting to know each of them better, through the Plowshares 4 defense with Ramsey, and at the still-newly raw 1995 Trial Lawyers College with Gerry. Ramsey is lowkey, while Gerry’s personality and charisma fill countless football fields. Ramsey takes on many clients at no fee, whereas Gerry has spoken in awe of Tony Serra’s doing the same where Gerry was not ready to go to such pro bono lengths at the expense of his own creature comforts. Ramsey is very approachable, and perhaps becomes the superstar most when in a room full of so-called progressives and radical left political activists. Countless people perpetually want a piece of Gerry, so he remains in many ways elusive to most everyone, possibly even at times to his children. And then things flip around, where Ramsey’s calmness goes hand-in-hand with gentlemanly detachment, but Gerry wants to be invited into the groups at the Trial Lawyers College during role-playing exercises, and he hugs fully, after the years of pain, ups and downs, and recovered alcoholism he has lived and transformed decades ago towards winning, and winning big, to his final risk to his winning streak when he obtained Geoffrey Feiger’s far-from-assured acquittal, after connecting with the jury including stroking his hand over the railing otherwise separating himself from the jury as if to disintegrate that barrier, and bantering good naturedly with the trial judge. Gerry has his detractors — and a slew of huge fans — and even I remain part of the loyal opposition among Trial Lawyers College alums who view the Trial Lawyers College as having become over-institutionalized, overly about Gerry’s living legacy rather than transcending such attachment to but one personality, and thus overly forsaking its ability to be much greater, but of course Gerry remains a great man and great trial lawyer. Ramsey of course has his detractors, and his fans, and stirs infinitely more controversy than Gerry ever has. They both clearly know about the strong feelings they instill in people. They both focus on the victory. Tall, thin, and with his Texas drawl, Ramsey got up to the microphone for the handing of the 1987 award named after his father, and early on advised the Justice Department’s criminal division lawyers that “The ACLU is watching you” and of course the ACLU was on the tail of their boss Ed Meese, who perhaps only shared controversy in common with Ramsey. Fortunately, I learned to carry on early on even when far from popular with the crowd. Somehow, people sensed in both public school and summer camp to choose me close to last for pickup sports teams. I declined to be anything but the sober designated driver when my otherwise close friend and his other friend insisted on imbibing several drinks of alcohol one night in high school, and he soon became distant. I struggled for years to figure out what to do when taunted about my Jewish ethnicity and religion, but finally figured it out. And I fought back, often with sharply pointed words that sometimes drew punches, and sometimes with my fists until I learned at thirteen years old that by that age fists could seriously injure. Of course I was drawn to Ramsey Clark and Gerry Spence, because they fought onward no matter their popularity or not, even though Gerry seems to thirst for popularity, but not at the expense of his remaining real, and powerfully real at that. Taking stands for what is right can come at high prices. Rosa Parks learned that after she took her stand by remaining seated towards the front of the bus. 1968 Australian track star Paul Norman learned that when he declined to denounce his podium-sharing American track stars’ stand for racial justice on the awards platform, when Australia was still poisoned with apartheid. 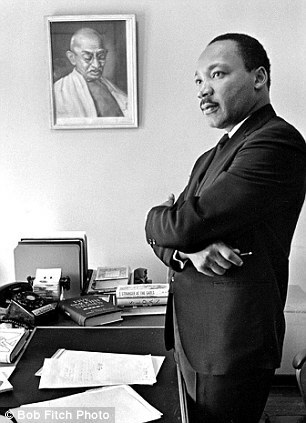 Gandhi lost his life as a result, and so did Martin Luther King, Jr., who perhaps with prescience had assassination victim Gandhi’s photo hanging on his office wall, and delivered his “I Have a Dream” speech just yards from the statue of assassination victim Abraham Lincoln. Some or many might use vicious verbal or other attacks on their opponents to seek advantage or to throw off or distract their opponents. If opponents’ attacks are to be addressed, their attacks are there to be neutralized, redirected, and deflated, and not attached to. When I battle with delight, even smiling broadly and with compassion at my otherwise most despicable opponent, because I cannot repress my delight in the fight on the side of right and my even greater compassion for my client — even if I wanted to suppress my delight in the first place, and why would I want to? — and because we must keep our friends close but our enemies closer, that can disarm my opponent, and at least start neutralizing my opponent, because the real opponent is only in my perception. My client can get swept up with me in that fireball of positive energy that focuses on directing a fan and proverbial fireball at any dirt thrown our way rather than descending into curses, complaints, and blind swinging. The courtroom battlefield offers so many advantages despite the potential boobytraps, flamethrowers, trap doors, and seeming allies who are ready to turn against me and my client at the drop of a dime. The fight for justice is exhilarating, and winning is even more so.